A big prominence visible during 2017 total solar eclipse, just before the end of totality (credits: Marek Substyk). Except of many phenomenas related to the total solar eclipse, that I observed away from the Sun there is a one, which is worth an attention. This is a prominences movement against the lunar disk, as we can observe during totality. As we know, everything moves on the sky. A fleeting solar eclipse is an effect of lunar movement against the Sun. This movement can be observed as change of solar crescent. During the totality the lunar movement can be noticed both by hiding and uncovering a solar chromosphere (which occur just after beginning and right before the end of total phase) and by shifting prominences jutting from dark lunar disk. 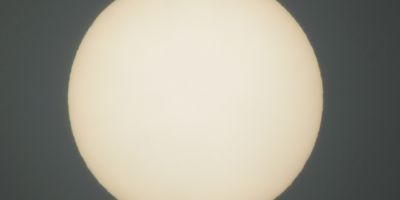 This is very interesting event, quite easy to spot when looking on the Sun through binoculars or long lenses. This giant objects with the temperature around 60000K and typical size on the order of 100000 km. 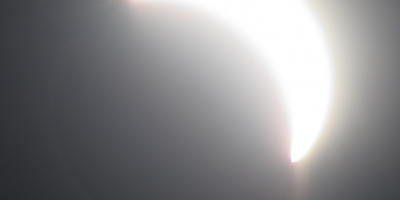 Sometimes the prominences may stretch across more than 500000 km of the solar limb (Mobberley, 2007). The biggest filament, observed in 2012 could have even 800000 km. Because the prominence is a large, bright and gaseous formation extending outward the Sun’s surface they invariably show up bright against the dark sky background, as do flares (Tandberg-Hassen, 1995). Most of prominences has a loop shape. Aside for the most extended prominences a big amount of quiescent prominences is to be seen around the solar limb. These prominences are long with sheet-like structures nearly vertical to the solar surface. Their dimensions are 60000-160000 km in length, 15000 – 100000 km in height and 5000-15000 km in thickness (Tandberg-Hassen, 1995). 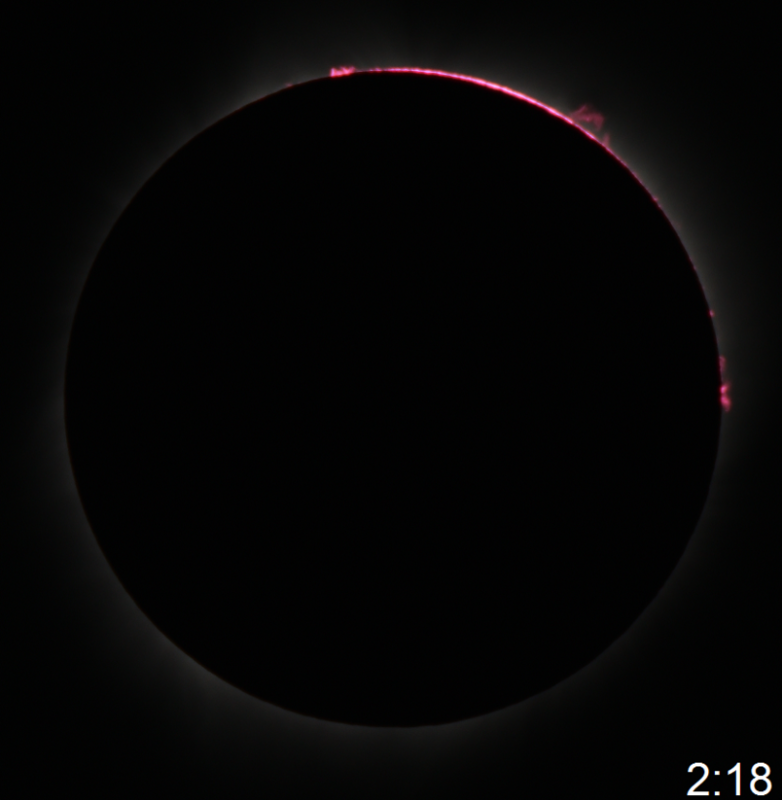 During total or deep annular eclipses a prominences are possible to see. They appear as a pinkish plumes. Is really hard to spot it by naked eye, thus small binoculars could be sufficient (Pic. 1). Pic. 1 A big prominence jutting just before 2017 annular solar eclipse in Argentina (credits: Glenn Schneider). The longest prominences are rare, but when occur we can see them even for entire totality (Pic. 2). An example above shows the biggest prominence, seen during 2017 total solar eclipse in Wyoming by PTMA (Polish Society of Amateur Astronomers) members. This prominence, marked by solid line (Pic. 2) was visible throughout entire totality and even a tens second before 2nd contact. Pic. 2 The biggest prominence visibility during 2017 total solar eclipse (credits: Artur Spaczyński, Marek Substyk, Agnieszka Nowak). The moment after beginning and before finish the total eclipse gives us the opportunity to see a lot of prominences surrounding the solar limb. Most of them, as remarked earlier are quiescent and can be seen as an additional, pinkish layer of solar atmosphere. These prominences can be visible especially during the slim total solar eclipses. Watching them during the Great American Eclipse and analyzing the photos from my colleagues I found, that less extended prominences hid behind lunar disk at 20 – 26 sec after 2nd contact and emerged on the opposite side at the same time before the end of the totality. These bigger ones were visible for next tens seconds up to mid-eclipse in places. 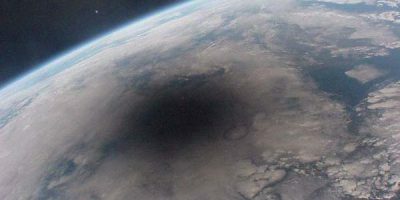 Their movement against the lunar disk has been recorded by all members of Great American Expedition, who used the Eclipse Orchestrator software. The easier way to record it is also placing the camera or camcorder (with telephoto lens mounted) towards the eclipsed Sun for entire totality. Below I gathered a 6 pictures represening a key moments of the 2017 total solar eclipse in Wyoming, where I covered a key moments, like entire dissapearing and reappearing of solar chromosphere and a mid-eclipse period (Pic. 3). Pic. 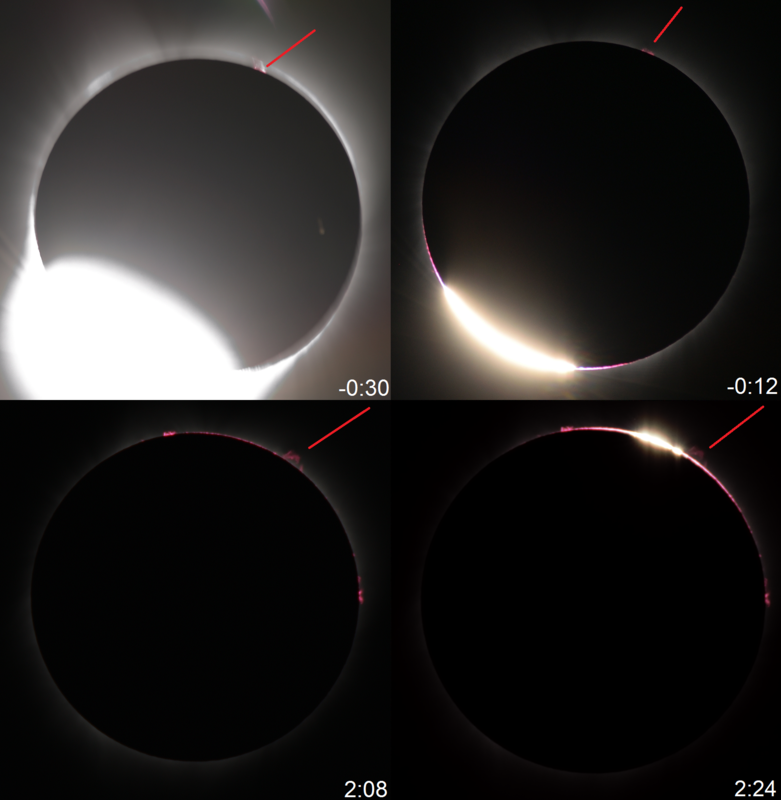 3 A key moments of shifting the solar chromosphere and prominences throughout the 2017 total solar eclipse in Wyoming (credits: Marek Substyk, Artur Spaczyński). Stacking the picture above I was trying to use the pictures with as much similar exposure as I could. 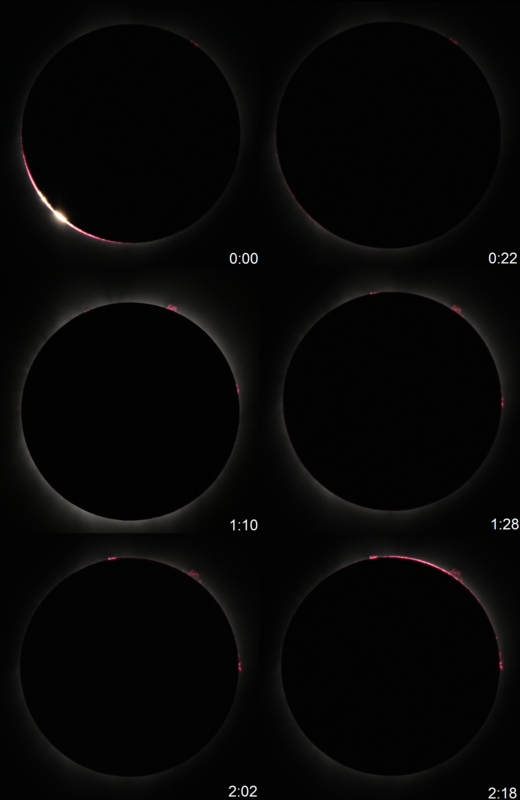 These images were produced with the Eclipse Orchestrator assists, which changes the exif data throughout the eclipse. Neverthelles each image shows how quickly the appearance of pinkish elements of solar atmosphere changes within this brief time. 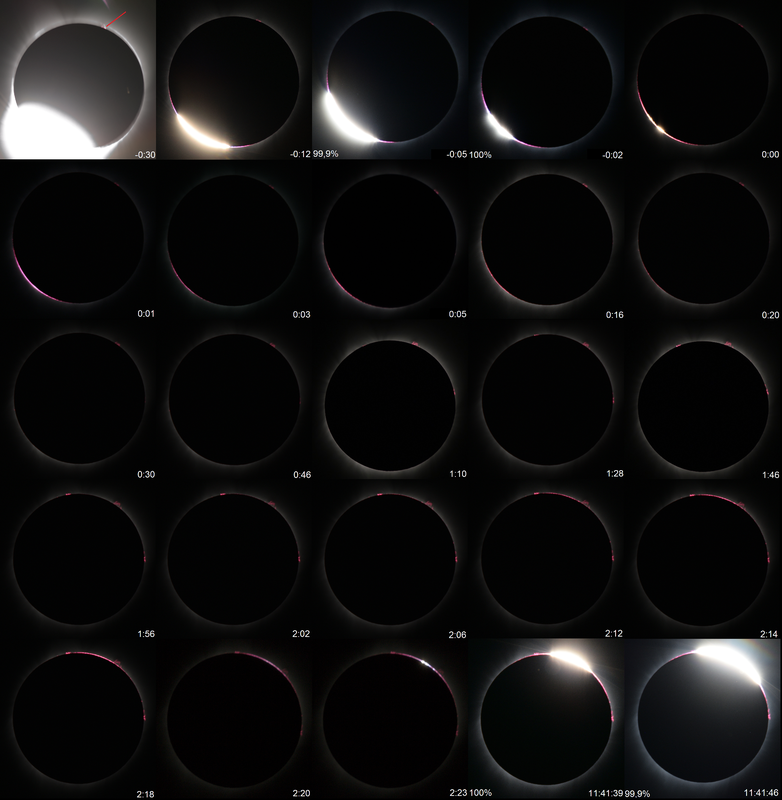 As a summary of the Polish Society of Amateur Astronomers (PTMA) eclipse imagery I collected every single photo next to each other as an entire result of the observation (Pic. 4). Pic. 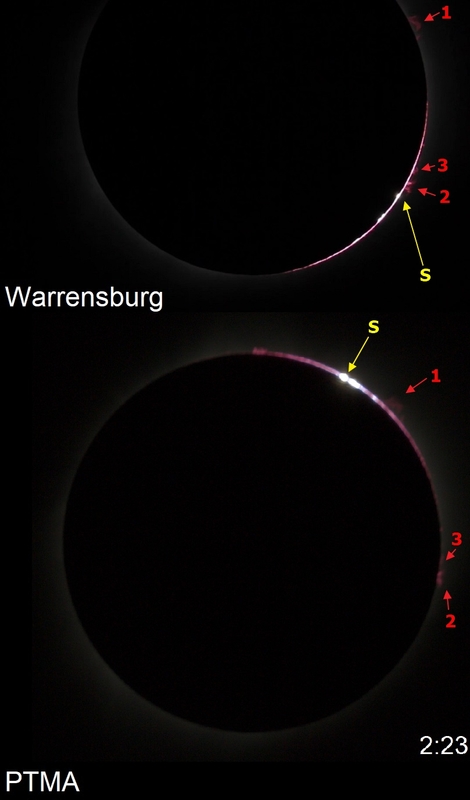 4 2017 total solar eclipse prominences movement across the lunar disk captured by Polish Society of Amateur Astronomers (PTMA) members in Wyoming (credits: Artur Spaczyński, Agnieszka Nowak, Marek Substyk, Aleksander Knapik). Click to enlarge. A swiftly change a prominence landscape throughout the totality was a result of the location, where the observation was carried out. Because all Polish Society of Amateur Astronomers (PTMA) members were placed almost roughly in the middle of the eclipse path (where umbral depth reaches 100%), then everything was happening the quickest, as it could. Usually in the middle of the path of totality an observer has the least amount of time to enjoy both diamond ring and the prominences view. On the opposite side are observers watching the totality near the edge of umbra, where these phenomenas appear much longer. How can we explain it? I will write more about this in the future. Now, for sake of simplification let’s take into account, that both Baily’s Beads and prominences appearance period is much longer at the umbral limit. In the movie below you can see how “long” both Baily’s beads and prominences with solar chromosphere are visible throughout the eclipse. The observation point was located only 1640 m from the southern umbral limit, just a bit north from Warrensburg, MO (Pic. 5). Pic. 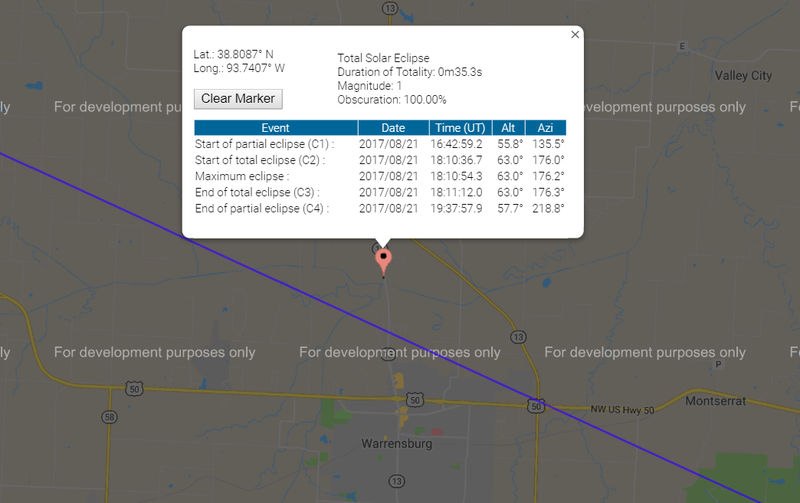 5,6 A presumed 2017 Great American Eclipse observation venue at the Warrensburg outskirts, MO, only 1,6 km from the southern umbral limit, where duration of totality was about 35s as per Youtube footage (Eclipse.gfsc.nasa.gov, Xjubier.free.fr, Youtube.com). Pic. 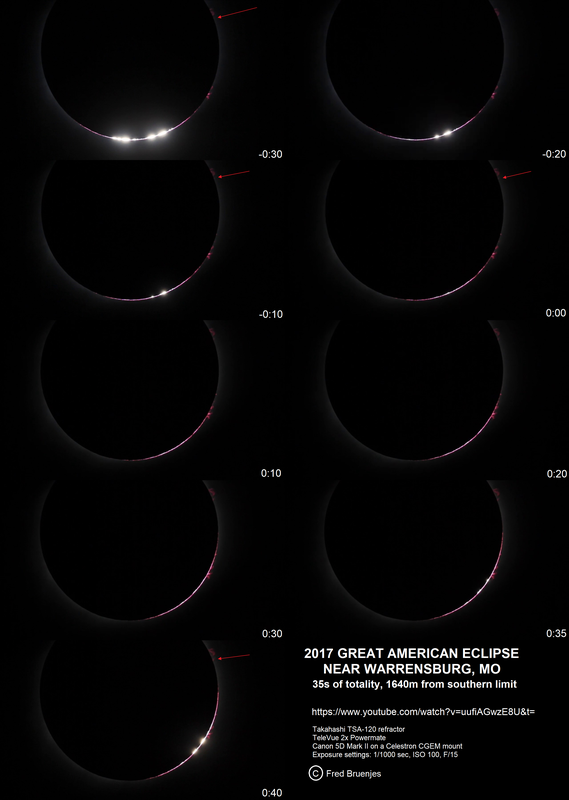 7 A compilation of 2017 total solar eclipse recorded at the Warrensburg outskirts, purportedly only 1640 m from the southern limit of totality, which lasted 35 s only. 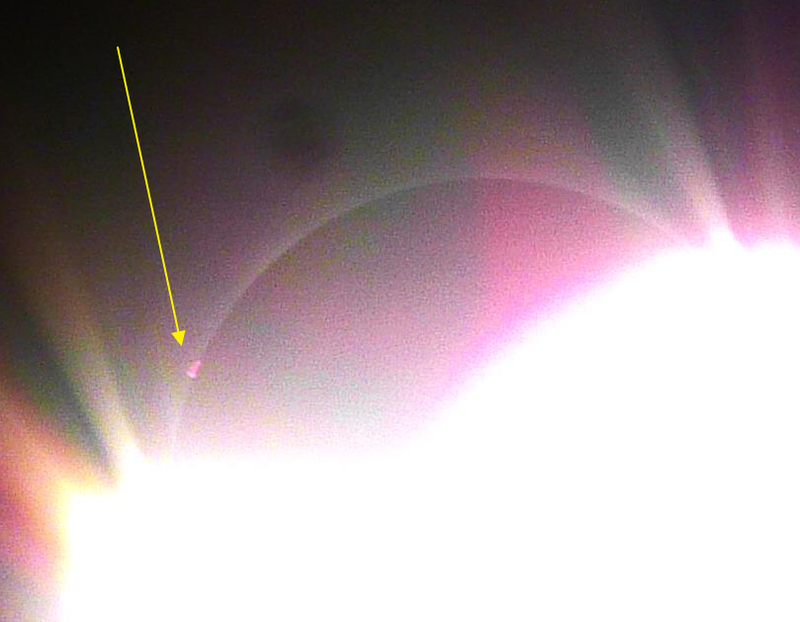 A red arrow shows a part of the biggest prominence as seen during this eclipse, which was rising above lunar surface as the eclipse progressed. Click to enlarge. Following the red arrow you can also see how the prominence movement across the lunar disk. An amazing prominence-rise above lunar surface has been covered by this footage as the totality progressed. Because the observation was taken nearby the souhern limit, the brightest part of the totality occur on the bottom side of the celestial disk. An observation of the totality immediately beyond the umbral limit is preceeded by long-lasting Baily’s beads, which start even more than 1 minute before through a slight fragmentation of the solar crescent, which next is separated on the single solar shafts, as seen in the picture above (Pic. 7). There is still another important issue, that must be risen in this article. Namely, the “place” of 3rd contact aginst the visible prominences. It is driven by a parallax phenomena and results a different configuration of the first shaft of sunlight to that of the major prominences visible, which basically varies for every single location within the path of totality. For sake of simplification, it looks different at the northern umbral limit, in the middle of the path and at the southern limit (Pic. 8). Pic. 8 A 3rd contact against visible prominences comparison between observation taken nearby southern limit of umbra at Warrenburg’s outskirts and near the middle of the path (Polish Society of Amateur Astronomers)(credits: Youtube.com, Agnieszka Nowak). As you can see, the 3rd contact occur in completely different region of the lunar surface. It also incur a different character of diamond ring, being reliant on the lunar topography. A red numbers correspond to the prominence size, which were visible that time. A number 1 indicates the biggest visible prominence, 2 – a 2nd one, etc. 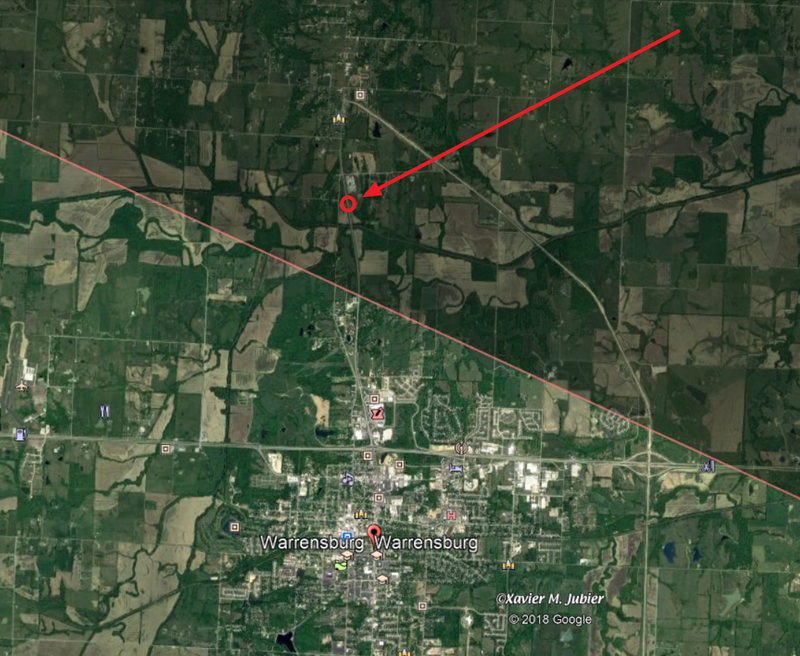 Howeverthis is not authoritative enough, because a footage from Warrenburg didn’t cover an upper part of the totality. The numbers has been used for exemplar reference. Anyhow, th difference is considerable. If we would place an another observer somewhere in the middle between these 2 places, then 3rd contact would occur somewhere between prominence 1 and 3. This is a good chalenge for future eclipse observations – place a few observers in one line between northern and southern umbral limit and do exactly the same observation. Threading this way we should gain an analoguous prominence movement across the lunar disk caused by parallax instead of celestial movement itself (however celestial movement is also related to parallax, which works differently here).